Chengdu Shuangliu International Airport is located 20km (12 mi) outside of Chengdu city centre and is one of the main air hubs in China, recently ranked 4th in passenger volume. It serves flights to/from most major cities in China, many smaller cities within Sichuan, and some international destinations including Amsterdam, Bangkok, Denpasar, Frankfurt, Hong Kong, Kathmandu, Paris, Melbourne, Sydney, Moscow, Osaka, Kuala Lumpur, San Francisco, Seoul, Singapore, Taipei, and Tokyo. Bus #1 operates an express service between the airport and the city centre, costing ¥10, stopping at the Air China airline office on Renmin Nanlu (2. Section) next to the entrance of the Minshan Hotel (there is no bus stop! just look for a bunch of taxis/pedicabs, since they are also waiting for the bus. The last bus leaves the airport around 01:00. Bus #2 also runs from the airport, and is not an express, so can take some time. It runs all the way to the North Railway Station. Fares vary, but to Tianfu Square it’s ¥10. The buses have luggage compartments. They are well signposted within the airport terminal and, because they leave from immediately outside, are easy to find. Taxi fare from the airport to the city centre averages ¥45. There is no extra charge for luggage or additional passengers. When going from the city to the airport, add an additional ¥7 to cover the toll on the Airport Expressway. If you intend to take a taxi from the airport, head for the domestic arrival area and exit the terminal where you should see the official taxi stand where you can queue for marked, green-and-yellow or blue-and-yellow taxis. If you are coming from an international flight, this is right at the other end of the terminal – almost past domestic arrivals. Beware scammers and pirate taxi operators who are waiting to prey on foreign tourists with unmarked vehicles both inside and outside the terminal. Beware some who may sport official-looking, but fake, identification. Even official taxis that you might pass on the way to the taxi stand will try to negotiate a fare instead of using the meter. The fare offered will often exceed ¥100, and if you bargain with them, you may find yourself sitting in the cab for a while until agreeing to raise the price back up. Train connections are available to most cities, such as Beijing, Shanghai, Kunming in Yunnan, Chongqing and Xi’an. Chengdu Station (成都北火车站) (Chengdu North Station), (Line 1, Chengdu North Metro Station). It is called Chengdu Station on railway ticket, but is usually referred as “North Railway Station(Huo Che Bei Zhan)” by local people and some maps. Handles most long distance services. Trains to Dujiangyan(the city that holds Qingchengshan-Dujiangyan National Park) also depart from this station. High speed train or Bullet trains to Chongqing (¥97-2014,No. )depart from both North Chengdu Station and East Chengdu Station. So you have to check the train time table certainly. If you go to the wrong station, you will miss the train which you want. The first line of the Chengdu Metro opened in October 2010, slicing north-south through the city along Renmin Rd and connecting the North and South railway stations together. The fare for a single ride is ¥2-4 depending on distance. You can purchase tickets from machines (English available) with ¥1 coins or ¥5 and ¥10 notes. Ticket booths are also available if you don’t have suitable notes. When entering the metro you need to put your bags through an x-ray machine. Sep 2014: Don’t have any fluids like a bottle of water in your luggage: you will have to have those checked separately. The ticket is flashed by the gates on the reader on your right side. You need the ticket to get out as well so keep it safe. When exiting the ticket is placed into a slot that collects it. Again this slot is on the right side of the gate, so pay attention since it’s very easy to accidentally open the gate next to you. When exiting, you must wait behind the yellow line until the passenger in front of you has passed and the gate shows it now accepts your ticket. If you’re beyond the line the gate won’t let you through and you need to back away for it to accept you as a new passenger. 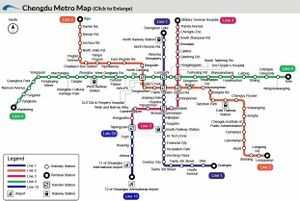 Line 2 of the Chengdu Metro was extended in October 2014. This line now runs from Xipu in the North West of Chengdu to Longquanyi in the South East, interchanging with Line 1 at Tianfu Square Station. From Line 2 you can switch to the BRT at Niushikou station. Line 3 opened on 31st July 2016. As of March 2017 its’ stops include Xinnanmen bus station and Chengdu Zoo. Line 4 opened on the 26th December 2015. At present it goes from Wannianchang in the east to the Intangible Heritage Culture Park in the west. By 2017 line 4 will be extended further at both ends. Line 3 should also be operational by then.